How often does my lawn need feeding and treatments for weeds? Every single lawn I have ever worked with has been different to every other. So when a homeowner asks “How often should I apply lawn treatments?” I tend to be a little cautious with my answer – until I’ve learned more about the lawn. Generally though, 5 lawn treatments per year are ideal for most lawns. The condition of a lawn depends on lots of different factors. The soil beneath it. How deep is it, what’s its composition? The grass species within the lawn. Robust ryegrasses or shallow rooted fine grasses? 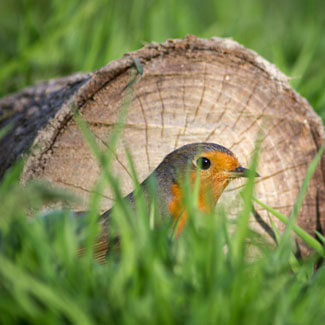 The area beyond the garden – could seeds blow in from neighbouring fields? Is there a lot of pollution from traffic? Is it visited by wildlife? Of course that means that lawns in different parts of the UK, That’s why, although I love reading lawncare articles online and in books, I think it’s important to make decisions based on plant physiology, local knowledge and experience. 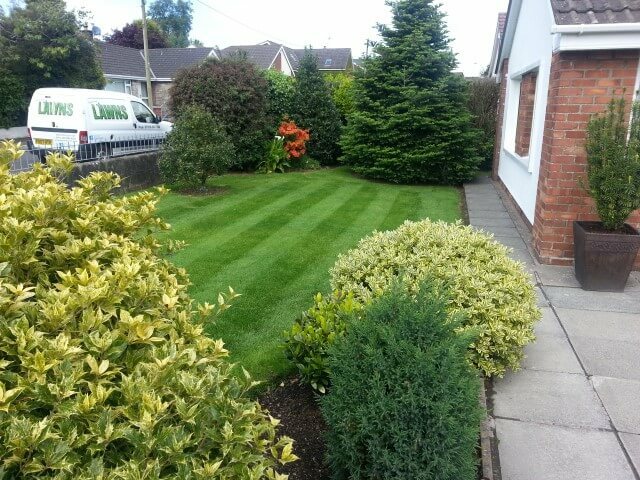 The clay soils around Belfast and the high average rainfall in Northern Ireland bring a unique blend benefits and challenges for a lawn. For a reasonably healthy lawn with a medium amount of foot traffic, no dogs, plenty of sunshine and deep strong soil I usually recommend five treatments per year. Each one tailored to the individual lawn and the seasonal needs of the grass. Midwinter is when the dreaded moss is at its most vulnerable. If you can treat moss in January, you will have a much better chance of controlling it. The midwinter treatment I recommend is an application of winter feed containing plenty of Iron. 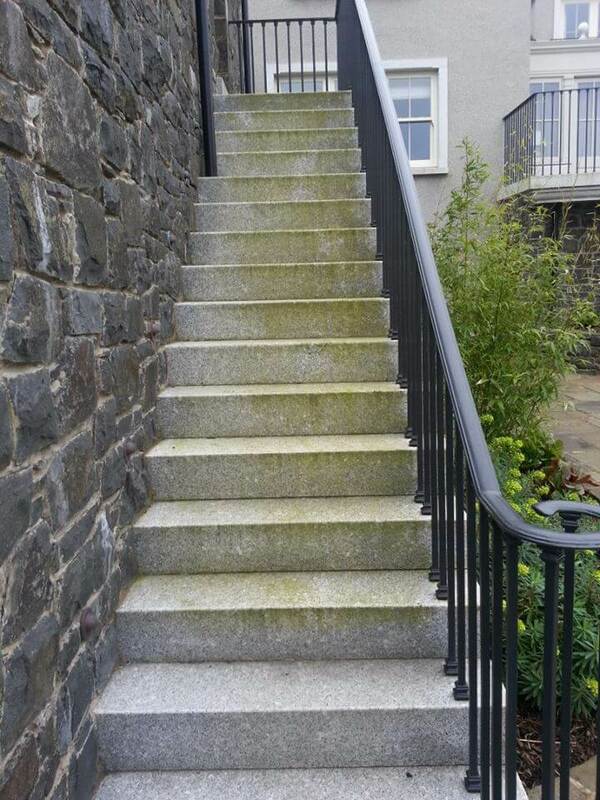 Iron gives grass a lovely deep green colour and it burns moss plants. If moss is a big problem in your lawn, it could be caused by shade. Between November and February, the time is right to prune trees and cut hedges allowing more light into the lawn and discouraging moss. As the soil warms up and the days get longer, the grass will start springing into life. Winter rain will have washed many of the important plant nutrients out of the soil. A balanced slow release fertiliser will help the grass recover from winter. Slow release means that the nutrients won’t be washed away in the first downpour of rain. Weeds will be growing fast too. Professional herbicides work when they are drawn into the leaves and roots of the plants. The faster the plant is growing, the faster the sap flows and the quicker the herbicide will be absorbed and get to work. So spring is a good time to control common weeds. May – July is when your lawn is growing fastest. Regular mowing is essential to keep it tidy and encourage the growth of side shoots. Side shoots or tillers, give the sward that lovely velvety texture and help the lawn cope with the wear and tear of summer usage. 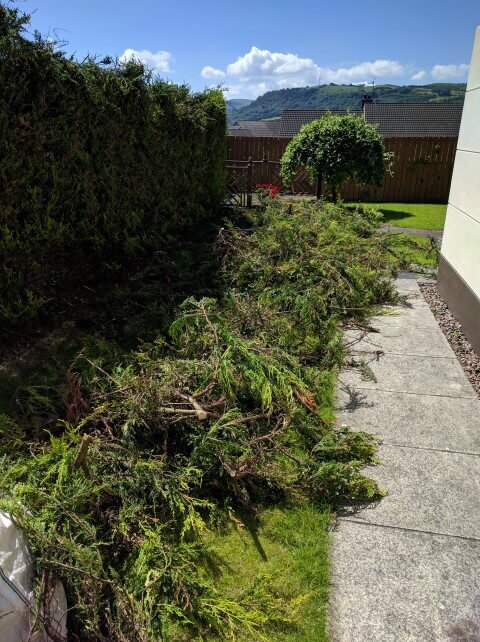 This garden in Jordanstown benefits from regular lawn treatments – and it shows! Some stubborn weeds need a second dose of herbicide before they get the message and timing is all important. Leave it too late and the weeds may have recovered from the first dose and regained their strength. 6-8 weeks after the first weed control treatment is the optimum time for the follow up application. By now, the spring feed will be exhausted too. Time to top up the levels of soil nutrients because May – July is when your grass is working hardest for you. By august or September – depending on the weather we’ve been having – your lawn will seem to be growing slower. But don’t be fooled by what you can see above the ground. Below ground, the roots know that winter is on its way and they are growing like billio to make sure they can protect the plant against winter frosts. In late summer I like to apply a seaweed tonic to help the grass recover from the stress of summer. Seaweed contains a lot of iron which gives the lawn a lovely green colour and helps it to harvest energy from the sun so that those roots can grow. It’s especially beneficial if the lawn is regularly used by children and pets. A general fertiliser will make sure that the plants are well fed and healthy and better able to resist diseases such as redthread and fusarium. Both of these are more prevalent in autumn. Slower grass growth tends to highlight the presence of any weeds too. As part of our late summer lawn treatment, we’ll include a free herbicide application. It’s time to step back and assess the lawn’s performance during the year. Were there any problems that might need to be addressed with separate renovations? Grass growth has slowed but not stopped. However, your lawn should still look good. After all, it’s possibly the main source of colour in your garden at this time of year. The clay soils around Belfast are typically quite cold and wet in the winter. That’s a challenge for plant roots and for the soil microbes that are so important to plant health. An autumn winter formulation lawn feed accompanied by my special seaweed feed will nourish and support the grass plants as well as support soil microbes and help manage disease. The result? 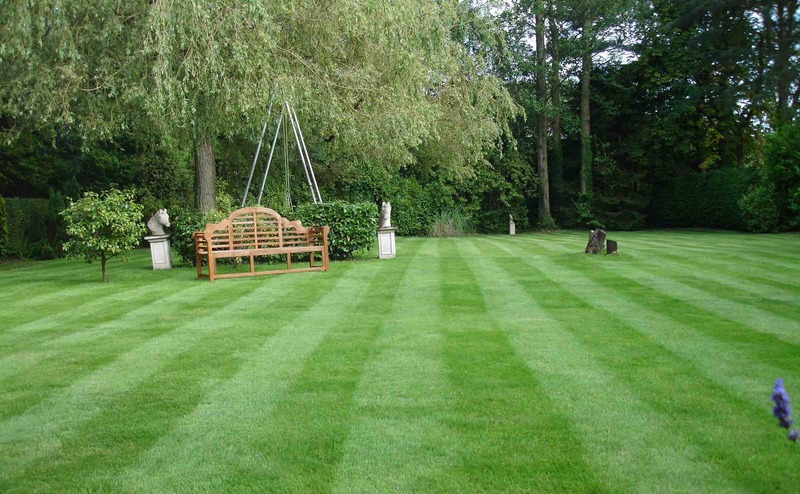 A lawn that you can be proud of – even on a dull winter’s day.